Dining at Le Royal Monceau is an effervescent affair as French restaurant La Cuisine is styled as an expansive family dining room while Il Carpaccio serves fine Italian cuisine. Pastries and desserts throughout the hotel are created by the renowned “Picasso of pastry” Pierre Herme. Le Royal Monceau Raffles Paris has opened the highly anticipated Spa My Blend by Clarins, designed exclusively for the hotel. Philippe Starck has created an ethereal white paradise of luxurious simplicity and timeless elegance to inspire relaxation and pampering. At the centre of the 1500m2 spa is an eye catching 28 metre swimming pool; bathed in natural light and the largest in any Parisian hotel. The revolutionary new concept, My Blend by Clarins, by Dr Olivier Courtin, is a unique range of fully customisable skin care products designed for the individual needs of every skin type at every age. 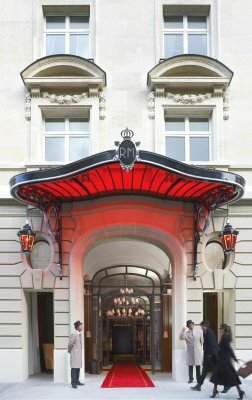 The bespoke facial treatments, exclusively available at Le Royal Monceau Raffles Paris, begin with an in-depth skin analysis to determine the biological age of the skin, followed by expert application of the personalised treatments by ‘My Beauty Coach’ and polished off with a Clarins make-up session. Each guest also receives a two week supply of their personalised skin care products ‘My Blend Day and Night’ Essentials with Emergency Boosters. The Spa also offers the essential Clarins products and includes body treatments, massages and traditional facials for men and women and hair care is provided by Leonor Greyl. Spa packages include the My Day Spa discovery pass – the ultimate in tailored treatments and fitness programmes: My Blend Facial, Clarins Body treatment or massage, and Fitness session with a personal trainer. The Spa aims to ensure guests feel like they are floating on a cloud and this feeling of total serenity is attended to by carefully selected experts: 12 highly trained ‘My Beauty Coaches’, ‘My Pool Coach’ providing swimming lessons and aqua fitness, 12 ‘My Body Coaches’ for personal training and ‘My Spa Concierge’ managing the appointments of hotel guests and spa members. The Spa My Blend by Clarins features seven treatment booths, including one VIP double cabin, where Ladies are pampered in rooms of pure white with feminine hints of translucent pink and gentlemen are welcomed into their treatment zones via a large stainless steel hall. Both Ladies & Gentlemen’s areas feature a sauna, Turkish bath, laconium, shower experience and ice fountain. Saint-Nom-la-Breteche Golf – Reservations with our concierge team. Roland Garros – Reservations with our concierge team. Available 24/7 – Assistance at all times. Inspired by the 1940’s and 50’s, Le Royal Monceau guest rooms, entirely transformed by the famous French designer Philippe Starck, are steeped in a past life, a story that the traveler is invited to explore. It is like visiting a dear friend who has handed you the keys to their private apartment, where the décor, the objects and the artwork are all part of a scenario. Le Royal Monceau offers 85 rooms (from 36 to 45 sqm) and 64 suites (up to 350 sqm) including 3 stunning Presidential suites. Well-appointed with sophisticated design, the Deluxe Collection Room offers a separate walk-in dressing room and a large bathroom with rain shower surrounded by mirrors. Overlooking the inner Courtyard or the Garden, the Deluxe Collection Rooms have an average size of 40 square meters. Well-appointed with sophisticated design, the Executive Room offers a separate walk-in dressing room and a large bathroom with rain shower surrounded by mirrors. Overlooking the inner Courtyard or the Garden, the Deluxe Collection Rooms have an average size of 45 square meters. This spacious suite makes you feel as if you were in an artist’s gallery with a unique decor — sculptures and photos – embellished with elegant furniture. The Gallery Suites, overlooking the Inner Courtyard or the Garden, have a separate walk-in dressing and a large bathroom with a rain shower, all with an elegant design and an average size of 68 square meters. This luxurious Junior Suite offers a spacious open area, a separate walk-in dressing and a bathroom with rain shower is surrounded by large mirrors. Either courtyard or street view, the Junior Suites have an average size of 58 square meters. The Lifestyle Suite will make you feel at home with its separate living room of 35 square meters with a dining table, a spacious bathroom with a rain shower, as well as a separate walk-in dressing room. With its view over the Garden or the Street the Lifestyle Suite offers an apartment feeling, embellished with contemporary artwork all in an average size of 95 square meters. •Hand-crafted furniture designed by Philippe Starck. Discover this chic Parisian Suite offering a Parisian apartment feeling with its two bedrooms and view over Paris’ roof tops. The suite of 167 square meters also features a spacious living room, a kitchen, a bathroom flooded with daylight, as well as its private elevator and private entrance. Live like a true Parisian in our remarkably spacious Presidential suite with refined furnishings and decor. The suite features a spacious reception room, a dining room, an amazing large bathroom flooded with daylight, hammam and rain shower, a large walk-in closet as well as a fully equipped kitchen and private gym. Overlooking the Avenue Hoche and the inner courtyard, the Presidential suite has an average size of 350 square meters. The spacious Presidential (Monceau) Suite reveals the magnificence of Philippe Starck creations. Overlooking the Avenue Hoche, the Presidential Suites offer a separate dining area, a large walk-in dressing and a spacious bathroom with rain showers all in an average size of 117 square meters. 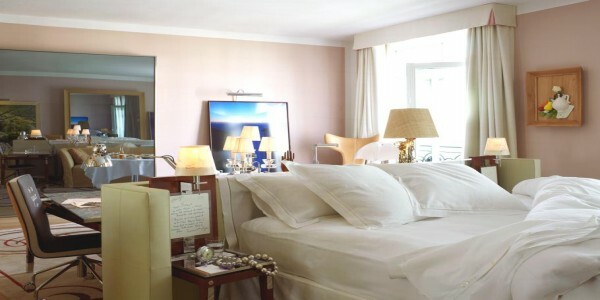 Unique suite of 190sqm, the Royal Monceau Suite has a spacious living room overlooking the Avenue Hoche, a separate dressing, a fully equipped kitchen, an amazing large bathroom flooded with daylight hamman and rain shower. The Signature Suites, with its bedroom separated from the living room, offers a refined artistic ambiance and clearly reflects the quintessential style of the 1940’s and 1950’s. With either a garden or courtyard view, our Signature Suites have large bathrooms and spacious walk-in dressing rooms all in an average size of 72 square meters. As an artist studio, this warm room styled by Philippe Starck offers a large bathroom with rain shower and a separate walk-in dressing room. A space of intimacy, overlooking the inner Courtyard or the Garden, our Studio rooms have an average size of 36 square meters. The Italian restaurant, presents a gastronomic cuisine in an audacious and artistic atmosphere, overlooking the garden. With the leadership of Laurent André and the great help of Chef Roberto Rispoli, Le Royal Monceau provides Paris with a restaurant entirely dedicated to Italian fine cuisine. La Cuisine offers French cuisine with refined, generous and spontaneous cuisine in an elegant decor that combines an open kitchen, a table d’hôte and private alcoves. La Cuisine’s gourmet experience ends on a high note with desserts created by Pierre Hermé. Located at the heart of the hotel, though slightly secluded, Le Bar Long is raised and located just behind Le Grand Salon. At its center, a high, long, narrow and luminous bar. Here people can sit and, depending on their mood, remain alone, think, dream or talk to the person opposite. For the bar, Philippe Starck wanted to break with conventional and the unique and repetitive face-to-face layout between patrons and a barman moving behind a bar. Le Grand Salon has been inspired and designed as a living room that welcomes guests all day long to meet, gather, eat and relive the effervescence of the 1930’s.